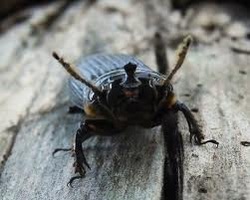 Bess Beetle is a nickname for Passalidae. Bess Beetles can make 14 different sounds rubbing their wings together. This is called stridulation. 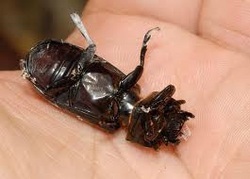 Bess Beetles have wings but can't fly. The larvae looks more like a worm than a beetle. Some beetles have 4 body parts. There are more types of beetles than any other animal in the world. The Bess Beetle has tiny gold fringes on its legs to keep its legs clean. Fireflies are a type of beetle. The beetle making a noise called stridulation. 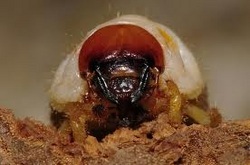 A beetle with its antennas raised,and example of horn.